Picked fresh from the farm to delight your special recipient with its elegant beauty, the Lavender Twilight Mixed Flower Bouquet is set to send your warmest greetings to friends & family near & far. Hand gathered in select floral farms & bringing together the enchanting color combination of lavender & white, this flower arrangement has been picked fresh for you to help celebrate a birthday, express your thank you or get well wishes. 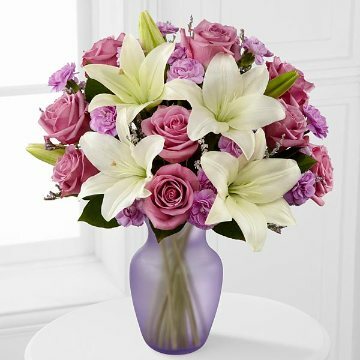 This bouquet includes the following: white Asiatic Lilies, lavender roses, lavender mini carnations, lavender limonium, & an assortment of lush greens. Presented with a lavender frosted glass vase. Available with a 4-piece gold box of Godiva® Chocolates. Premium bouquet is approx. 18"Hx14"W & arrives with Godiva® Chocolates.